My family is participating in the 100 Acts of Kindness Project. I think this is a great idea, particularly so soon after the Christmas period. Christmas is a lovely time for my kids but I find that we are left with a bit of a Christmas hangover – too much stuff and attention in a very short space of time. 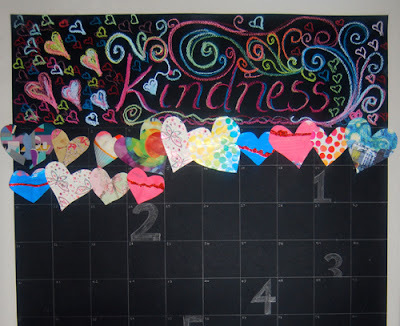 The Kindness Project has been a great way to focus on other people. Cakey helped her friend when she fell off her chair. Daddy took the girls out so mummy could have a peaceful sleep-in. Boo gave her friend a biscuit. Mummy let someone go in front of her in the supermarket shopping queue. As you can see these acts are quite small but they have been a fantastic way to start a conversation about kindness. I love the poster! I think it's the small acts of kindness that are the most important. Great lesson! Thank you. It is a great idea from Toddler Approved. Beautiful poster and the project idea is so lovely!